On the 26th of March 2018, Grab announced that it has taken over Uber’s operations in Southeast Asia. Then, the drama began. 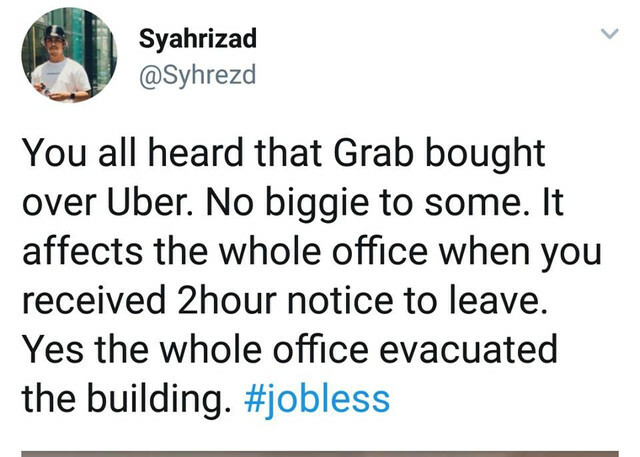 After the announcement was made, the staff of Uber apparently only had a 2-hour notice to leave their jobs, and they were not happy about it. Uber’s Southeast Asia marketing team in particular have been put on gardening leave, with Grab planning to offer them new roles. However, on the same night, Ong Chin Yin, the Head of People at Grab, released a video. On the 27th of March at 4:30 pm SGT, Grab will reach out to the Uber staff. Grab plans to address their queries, and offer them suitable roles within the company. The town hall meeting is not only being held in Singapore, but simultaneously in other countries as well. Certain Uber staff members have gotten details of the meeting, and Grab is counting on them to spread the news. The Grab-Uber merger is the largest-ever deal of its kind in Southeast Asia, with Uber having a 27.3% stake in Grab. Meanwhile, Uber customers have been informed by email that the official transition from Uber to Grab will happen on the 8th of April. “All requests after that date should be made from the Grab app,” the email states.